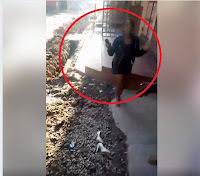 Home / Entertainment News, Videos / DRAMA along Mirema Drive in Roysambu between a SLAY QUEEN and a taxi driver after she refused to pay, these slay queens are useless(VIDEO). Sunday, February 3, 2019-There was drama along Mirema Drive in Roysambu after a slay queen refused to pay a taxi driver his dues after she reached her destination. A video going rounds on social media shows the taxi driver confronting the slay queen and demanding to be paid what belongs to him. Some brainless men who seem to be friends and neighbors of the broke slay queen who couldn’t afford to pay 700 bob side with her and start harassing the taxi driver. The taxi driver was forced to call a cop at Kasarani police station to request for security back -up after they threatened to destroy his car. Cases of slay queens around Roysambu refusing to pay taxi drivers after they reach their destination have become so common. Watch video of the daylight drama.